You are here: Home / Uncategorized / Happy National Chocolate Milkshake Day! It’s the most wonderful time of the year! 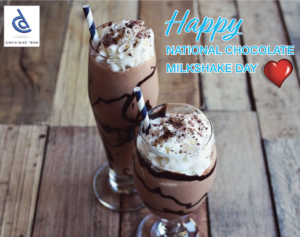 That’s right, it’s National Chocolate Milkshake Day… And what better way to celebrate this great holiday than to indulge in this favorite chocolatey dessert one last time before the fall season rolls in? In true chocolate lovers’ fashion, we scoured the area for the best chocolate shakes in town. Below are our favorite finds in the Sacramento area! Leatherby’s: If you’re a local, you’ve probably stopped by this family-friendly parlor at least once for a ginormous sundae loaded with toppings and warm chocolate sauce, classic all-American food, and great service. You really can’t go wrong with any of their creations including their old-fashioned milkshakes served in the tin and topped with fresh whipped cream. Order a shake and some crispy fries for the ultimate pairing! Vic’s Ice Cream: Vic’s Ice Cream is another classic creamery not to be left out on this special day. This adorable parlor takes you back to the good old days (literally) with its retro vibes and simple yet delicious flavors. They’re known for serving up a mean chocolate malted milkshake along with other concoctions including their banana splits and hot caramel sundaes. Cowtown Creamery: Need your ice cream fix at Cowtown Creamery? Try and catch them… if you can! This mobile ice cream truck will be making several stops today around town. They’re especially known for their creamy milkshakes, frozen lemonade, huge banana splits and refreshing ice cold lemonade. Check out their schedule here and their jam-packed menu here. Flip.n.Shake: What’s goes together better than peanut butter and jelly? Milkshakes and hamburgers…At least that’s what Flip.n.Shake thinks and we can’t really argue with them. Their shakes are thick and creamy and they pair perfectly with their loaded specialty burgers and fries. Check out the full menu here! Gunther’s Ice Cream: Last but certainly not least, Gunther’s Ice Cream is another great spot to grab a chocolate shake. This long-standing parlor has earned its fair share of loyal visitors over the years because of their ongoing dedication to creating delicious homemade ice cream (with flavors galore!) and equally tasty sandwiches. Browse through the menu here. Do you have any other favorite parlors that you visit specifically for their chocolate shakes? Let us know in the comments section below! "Bridget did an outstanding job. I couldn’t be happier with her professionalism or her hard work in securing a home for my wife and I. "